Hazel Beer spent her early life in Meadowbank and moved to Clyde River to be married, raise her family and enjoy her retirement. Hazel died at the Prince Edward Home on May 26, 2012. Hazel was a devoted mother and a role model, confidante, mentor and inspiration to her children – Blois (Audrey), Doreen (Jim Pound) and Vivian and her grandchildren, Kenny (Krista Leard) and Jennifer Pound, Andrea and Amanda Beer. Recently, Hazel was thrilled to meet her first great granddaughter Emma Lynn. Hazel was the daughter of Harry and Janie MacLean, and a sister to Jean (MacEwen), Lorne (Sadie) and Louis (predeceased). She was predeceased by her husband John in 2004. She is survived by sisters-in-law Hilda Beer, Norma MacLean and Reta Beer. Hazel married her childhood schoolmate John Beer when John returned home from World War II. They raised their children on the Beer “millwright’s” property, Ardmore Farm on the Bannockburn Road. Later Hazel and John moved to their retirement home on the Trans Canada Highway. In 2011, Hazel moved to Geneva Villa and enjoyed her stay there until her illness earlier this year. After hospitalization at QEH, Hazel went to the Pallitative Care Unit at Prince Edward Home. Her children were always close by. Hazel was a life long member of the Burnside Presbyterian Church, Atlantic Missionary Society and Clyde River Women’s Institute (CRWI). In fact, Hazel was a charter member of CRWI, and the first meeting was held at her home. In 2000, Hazel was a special guest at CRWI’s 60th anniversary held at the Riverview Community Centre. 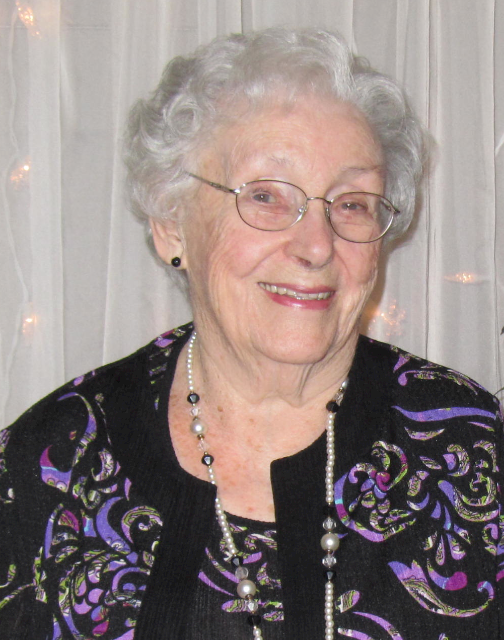 Hazel taught community school for many years, teaching knitting, crocheting and quilting. She knit for missions, the hospital nursery and Canadian Red Cross. When the History and Stories of Clyde River (2009) was being written, Hazel Beer was very helpful. Not only did she have a great memory for the past, but she had faithfully kept scrapbooks over the years, and these were extensively used throughout the development of the book. The entire community of Clyde River will miss Hazel and will remember her friendliness and graciousness. Sincere sympathy is extended to Hazel Beer’s family. I (Emily Bryant) am adding a personal note. When Vans and I moved to Clyde River 25 yrs. ago, Hazel and John Beer were the first people to invite us to their home. Later Hazel and I planned the celebration for the 40th anniversary of the CRWI – I, as rookie, and Hazel, providing history and wisdom. In the past few years, I would drop in from time to time to visit her in Clyde River. She always looked so nice and was so welcoming. Vans and I were honoured to sing at Hazel’s 90th birthday party and last year at a Geneva Villa event.